For great birthday party food pour blue tortilla chips into a serving bowl and serve with Rotel cheese dip. Cook ground beef and drain off grease. Add chopped onion and let cook until onion is tender. Add Rotel tomatoes (break up tomatoes with your hand). Slice up Velveeta and add to other ingredients. After cheese is melted, remove from heat and let stand until thickened. Make a really long lightsaber by assembling individual foot long subs and piecing them together by cutting the ends. Stuff each with your choice of ham, turkey slices, pepperoni, sliced cheeses, lettuce, tomatoes, purple onions, black or green olives and bell peppers. Mayonaise, mustard or vinegar and olive oil can be used for the sandwich spread. Once the giant sub is assembled, wrap one of the ends with colored foil to look like the handle of the lightsaber. *You can also put only a few popular ingredients on the sandwich, like ham and American cheese and let the children make their own. Order out a pizza or make our pizza for your birthday party food. Either way you slice it, padwans love pizza and all birthday party food! Preheat oven to 425 degrees F. Spread pizza sauce evenly over crust. Top with pepperoni in a single layer, then with cheese. Add other ingredients as you would like such as mushrooms, onions and bell peppers. Bake on a heated pizza stone, or directly on the oven rack, for 8-11 minutes or until cheese is melted, bubbling, and beginning to brown. Let cool for 5 minutes, then slice to serve. 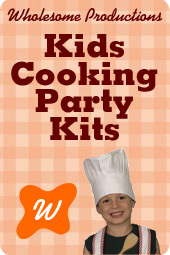 This birthday party food will be a hit for all ages. Bring meat and water to a simmer. Break up the meat into fine particles, as fine as you can get it. Add seasonings and mix well. Cover and cook until almost dry. Do not let it burn. Serve over a steamed wiener, in a soft bun with onions and relish, if desired. Squiggle mustard on the wiener. Make Malt Frosting before the cake. Chill for at least 2 hours. Preheat oven to 300 degrees. Prepare 3 round 9-inch cake pans with butter and flour and line with parchment or wax paper. Set aside. Beat oil, milk, yogurt, eggs and vanilla with mixer until well blended, about 2 minutes. Sift together sugar, flour, cocoa powder, baking soda and salt in separate bowl. Slowly add 1/3 of dry ingredients to milk mixture and beat until well blended. Beat in 1/3 of boiling water. Add another 1/3 of dry ingredients and beat until well mixed; then beat in another 1/3 of water. Add remaining dry ingredients, beating well, then add remaining water and beat until well mixed. Scrape mixing bowl often. Pour batter into prepared pans. Bake until toothpick inserted in center comes out clean, 45 to 55 minutes. Do not open oven while cake is baking. Cool pans on rack for 15 minutes, the remove from pan, take off paper, and continue to cool completely. Melt one 12-ounce package of semi-sweet chocolate chips in a saucepan over low heat, stirring constantly. Beat 1 pint whipping cream and 1-1/4 cups malted milk powder in electric mixer on high until stiff but not dry, about 2 minutes; refrigerate about 30 minutes. Whip 1/3 cup sugar, 4 ounces softened cream cheese and 1 teaspoon vanilla extract in a separate bowl until creamy, about 2 minutes, scraping bowl often.